With social media and the Internet playing such an important part in our lives, and images being the majority of internet traffic, it is essential to have good photos. Good photos can go a long way in helping to form an impression and make a mark on the Internet. Photo editing can do wonders to a raw picture. It can bring into focus a particular area in the photo, highlight, darken, sharpen, even change colour themes to bring about a change in the mood of the photograph. Editing not only enhances their beauty but also optimises it and compresses it. Photo editing is like giving a second layer of paint on a painting, enhancing, deepening, and retouching it. To get the best effects, one must use the best software. So here are 10 best photo editing software. Movavi picture editor is a extremely easy-to-use photo editor which perform a wide variety of functions. It can remove unwanted objects from your photos, enhance image quality, unblur photos, restore old photos, and retouch photos, along with all the other generic photo editing functions. You can replace the background in an image, apply text, reduce noise, use brushes, combine images and so much more. It has everything from basic tools, to advanced editing, and best of all, it can be used even without buying the software. 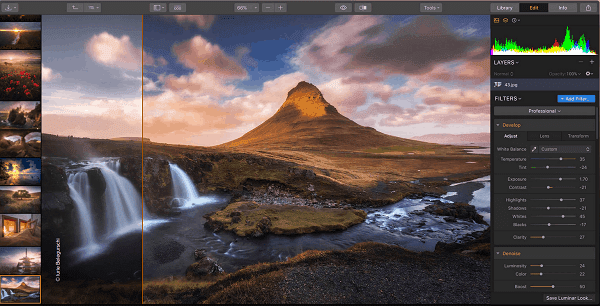 Skylum Luminar has had rapid growth and might even be on the way to replace Adobe because of its flat one-time fee and not the monthly subscription nom that Adobe follows. Skylum Luminar can be used individually or as a plugin to Adobe and works even with Apple photos. It also has an AI slider which can do an automatic fix for various things like brightening, fixing the lighting, bringing clarity, etc. it contains exclusive filters like the Sunrays filter or the Orton filter which further enhances your images. It also supports adjustment layers, image layers, and special presets for DJI drone photos. AI slider which makes things easy for the user. Capture one is a photo editing software developed by Phase One A/S. For those who are familiar with that name, they might have understood by now, that capture one is soon to be one of the best photo editing software in the world. It performs image editing, raw image file processing, image tethering and image cataloging. Capture One can work with raw files from digital cameras as well as TIFF and JPEG image files. It is available for Windows and Mac OS. Capture One has excellent customer support and gives users access to a database of articles written by the developers, along with articles and tutorials provided by leading photographers. It also provides Plug-ins to add features to the application further. However, it is proprietary software with a 30-day free trial version, after which you have to buy it. Files imported from cameras to Capture one don’t lose their quality. Has excellent connectivity in tethering with cameras. Has more local adjustment options than Adobe Lightroom or Photoshop. Has limited options for presets. May fail to work with DNG files. Pixlr is an impressive photo editing software with over 2,00,000 free effects and overlays, and a desktop and mobile app. It can be used to make simple edits as well as more creative tweaks, like merging images, collages, adding text and much more. It can be used by non-professionals and can be updated to Pixlr X for a more professional approach. It also provides pre-existing examples of edits for inspiration. Can save edits to cloud or download to local storage. The user has to download a lot of the effects. InPixio is an easy-to-use and flexible photo editor which allows users to delete and cut out objects, create photo montages, optimize, along with all the generic photo editing functionality. It is built in a way that even novices can dive right in and start editing right away. It is updated continuously, adding more incredible features to the already existing ones. It has a smart and intuitive interface and can support all major image file formats. It also has a beneficial community with easy tutorials, FAQs and support articles to look after your needs. Overall, it's a reliable and one of the best photo editing software. Compatible with all image formats. Needs a fast internet connection. No trial version for Mac. 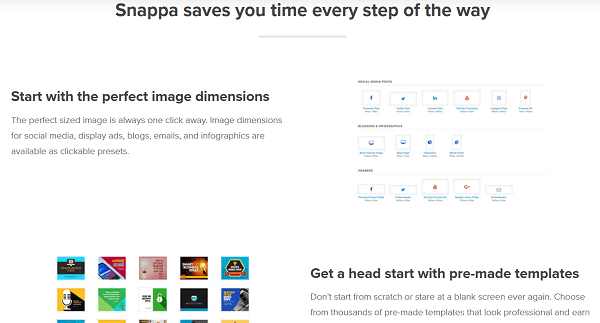 Snappa is an online photo editing tools for photographers who want to transform their images into pictures for blogs, social media banners, etc. it helps you get started with the perfect dimensions required for specific social media publishing. It contains free templates and many free high-resolution stock photos inside the application. It contains over 200 fonts, and over 10,000 vectors and graphics to choose from and no design experience is needed to use it. Direct access to Stocksnap.io reservoir for great stock photos. One fee for the entire package. No way to custom name the edits created. This is a specialized photo editor created especially for portrait photographers. It is fast and intuitive and can do anything you might need to portraits like edit skin tone, remove blemishes, etc. it also includes makeup tools to add to the features and has advanced layer functionality. On the whole, it makes retouching and editing portraits a whole lot easier and professional. It includes a trial version but you will ultimately have to buy the software. Useful for quick and easy retouching. Can fix lighting and add depth to images. Has the option to compare to the original photo while editing. Requires a lot of RAM. Edits can sometimes look fake or digitalized. Fotor is one of the best cloud-based photo editing software which has an online version as well as a desktop version. It allows you to perform all basic editing with Photoshop functionality and also enables collage making etc. it’s also useful for creating designs. It has a scalable editing option which allows you to check edits on your photos and allows you to work with several raw image file formats, and like Photoshop, it also allows you to save incomplete edits and complete them later. It includes HDR effects, photo retouching, design templates and a lot of fonts and stickers to choose from. Photographs can be merged to achieve HDR processing. Have to pay for some tools. 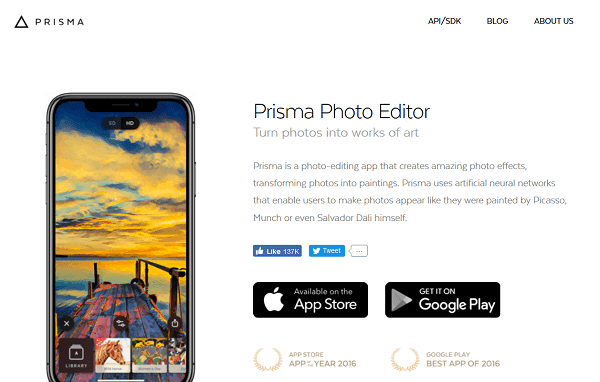 Prisma is a fantastic photo editing application which uses neural networks and AI to give artistic effects to your photograph. It is mainly a mobile editing application which is supported on iOS and Android. It contains many filters to change the rendering of the image and completely transform it, and it especially allows users to render images into the styles of famous artists. It is impossible not to include Photoshop in a list of photo editing tools. Photoshop is like the pioneer of all photo editing tools of this and the comparison point for most. It allows incredibly professional editing and is the go-to tool for photographers and designers. Its tools are still some of the best in the market and have not been replaced by any other tool. Photoshop is part of the Creative Cloud Suite of Adobe. So, there were some of the best photo editing software available out there.